Install a handicap sticker everywhere from doors, to parking lots, or even in restrooms. Each sticker clearly displays the handicap symbol, sending a clear message to all who see them. Use these stickers to reserve parking spaces, indicate handicapped accessible ramps, doors and restrooms, among other things. At Seton, we offer many different types of handicap stickers to suit all your needs, including a Handicapped Door and Window Decal. These handicapped stickers adhere to both glass and metal. Use them to mark doors that are accessible to persons with disabilities people, as well as to remind others to be respectful. Handicap labels instantly show your facility is handicapped accessible. Women's handicapped restroom signs allow you to prominently label women's restrooms. 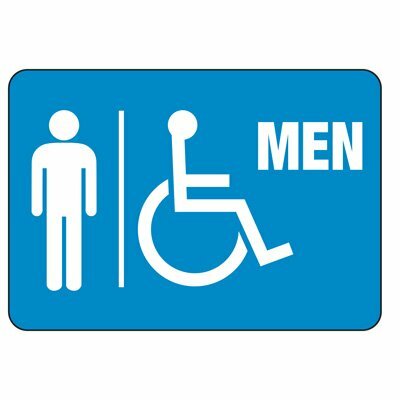 Men's handicapped restroom signs allow you to prominently label men's restrooms. There are many uses for handicap stickers. Use a handicap sticker to reserve a parking spot for those who need to park closer to your front door, label restroom stalls with the handicap symbol to remind others to be respectful of the needs of people with disabilities, or even use them to mark doors that are handicapped accessible. A handicapped sticker also helps your facility maintain compliance. At Seton, we offer several options to suit all your needs. Choose from a range of decals that feature the handicap symbol and messages such as, “Fire Rescue,” “Exit,” Accessible,” and much more. All of these labels are made from a tear-resistant, self adhesive vinyl. Use them inside or out, they are the perfect way to clearly label areas and mark doors. Ensure your workers and guests with disabilities feel comfortable at your business using handicap stickers and decals.